Sorry, no new game to add to the Archive. Just a story. They knew nothing of the J! Archive, so it was fun when John used his phone to access the site and I directed him how to find the game with Charles. John then read Charles clues from his game and we enjoyed playing along with some of them. Even though Charles and John are friends going back years, John had no idea that Charles had appeared on J! My past of being on J! had no chance to be kept secret or sprung as the pastor's husband had made it known early in introductions. Now that I am home it was nice to find that the game was still on DM, so that I could see what Charles looked like 30 years ago. San Francisco has a population over 850,000 yet it can be a small town with surprising coincidences sometimes. All of the links should work. I spoke to someone a while ago (Robert Knecht Schmidt? can't remember for sure) about updating my March 1992 games, esp. now that I have DVDs for them all. But that was a year or more ago. Is there a way I can put together the data to get my other games into the archive? Just let me know. Well, I'd be happy to do it, if you're patient, and I bet Mark Barrett would enjoy a break from his monthy entering of the media-heavy 2002 games he's been doing. PM either or both of us with what you're suggesting. And thanks for making your games available. Many (much? most?) of those early games in the Archive are thanks to players like you making them available to us. Thank you very many! The vids are available here. http://users.rcn.com/thomst/jpardy.html - This link has the Final Jeopardy! clues for the champion that Robert defeated in his first game, Thom Stark. Stark's first appearance was March 20, 1992, after Phil Yellman retired with $60K. What were the results for Thom's games (and I mean his previous two ones that he won)? Last edited by jlgarfield on Fri Sep 14, 2018 11:41 pm, edited 2 times in total. 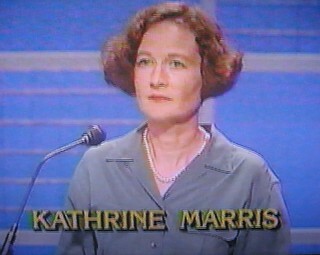 http://users.rcn.com/thomst/jpardy.html - This link has the Final Jeopardy! clues for the champion that Robert defeated in his first game, Thom Stark. Stark's first appearance was March 20, 1992, after Phil Yellman retired with $75K. I cannot get the link for AMERICANA $400 to work. The others should be fine. STAR WARS $400 is the 360,000th clue in the Archive. The FJ! clue was a good one not to ask for both. Yeah, don't think I ever would have gotten the other one. I only got the other one, oddly enough (due in no small part to this UToC FJ, although I didn't remember just how closely related its subject matter was). I think if I had had to guess both I'd have managed to get it right. Nice recall. With the 1800s hint he's the guy as I remember him and Harding as the scandal-ridden presidents named in high school history class. The broken clue is fixed as the clue was #27 in the round though marked as #28 in the system storing the images. Here's something neat I found on the internet a while ago: A publicity photo from that ep. Notice how the first round values are up on the board and that there different categories than the ones that were actually used. Sorry to bring this up a few months later, but on the next show, show #3 of season 8, Richard was ousted by the first 5x winner (of what would become 11 for that season) of the eighth season, Steve Newman. Last edited by Jeff-thecdboy on Mon Nov 12, 2018 2:13 pm, edited 1 time in total. Ah, the infamous "William Tell Overture played on teeth" interview! Thanks a lot for doing this, Myron. 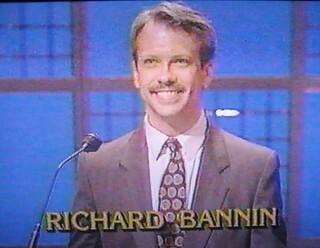 When I had modest success on Jeopardy! 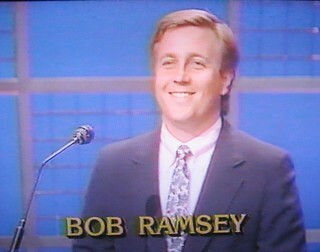 almost 23 years ago, I expected that it would be the beginning and end of my involvement with game shows. I had no idea how many great people and experiences would come into my life as a result of my continued interest and participation. The internet has had a big role in that, though it has also absorbed a lot of the the free time that people used to spend watching game shows. I am grateful to the folks like you and many others in the game show community who are passionate about Jeopardy! and the wider world of competition and trivia. It's always fun to to meet those people in person, and I hope to see you again this August at the TCONA event in Las Vegas. Good luck to all who still hope to be chosen as a contestant. Keep the faith! It was posted on the LL board today that Ed Toutant has died from brain cancer. I know one of the challengers in that game because he usually proctors the WQC in Los Angeles. So of course Alex gave his and Rachael's last names in the interviews, and not the other challenger's. 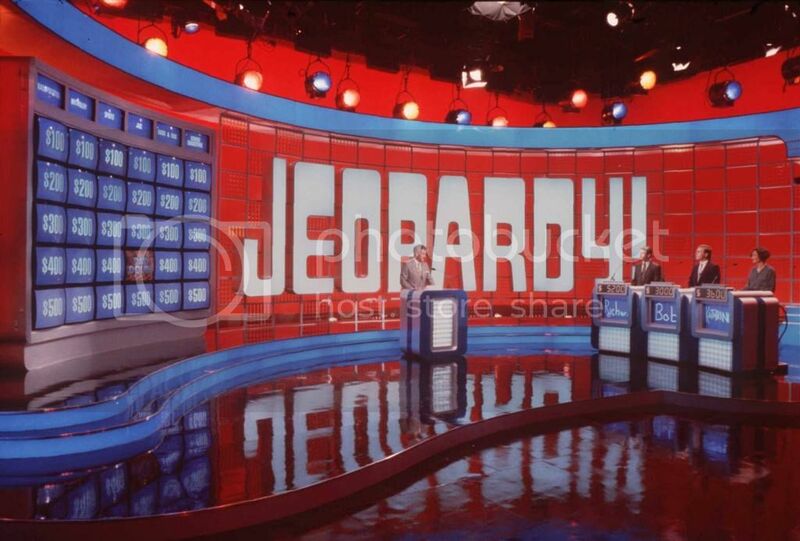 today is the release date for "The Jeopardy Book of Answers." Good read, lots of pictures. Because J! Archive is an archive of the games as they aired, we will not be adding the various unrevealed clues from the book's games into J! Archive.